Sharanya Manivannan was born in India in 1985, and grew up in Sri Lanka and South East Asia. 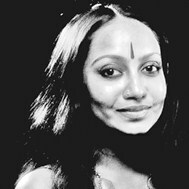 Her first book of poems was Witchcraft (2008), which The Straits Times described as sensuous and spiritual, delicate and dangerous and as full as the moon reflected in a knife. Her poetry, fiction and essays have appeared in several journals and anthologies, including Drunken Boat, Softblow, Killing The Buddha, Full of Crow and Pratilipi; a personal column, "The Venus Flytrap, appears in The New Indian Express. She was the recipient of the Lavanya Sankaran Fellowship for 2008-2009.
serration of every word you left unsaid. of me that did not outlive that burial. the distance at which you have held me. you with a certain, anamnestic shock. What gravity you wielded then. There was already darkness in me. smelt metal on your skin. of thorns needs a spine. handfuls of ore and residue. their threats to drift away.